I am looking into a set of BBS RM wheels from a VW. The size is 15x6.5 and the offset is ET33. I am thinking of fitting them with 205/55R15 or 205/50R15 tires. What spacers (if any) do it need? Thanks. No spacers needed with 205/50s but they look pretty terrible without them IMO. Some 205/55s bulge enough to touch the front struts. 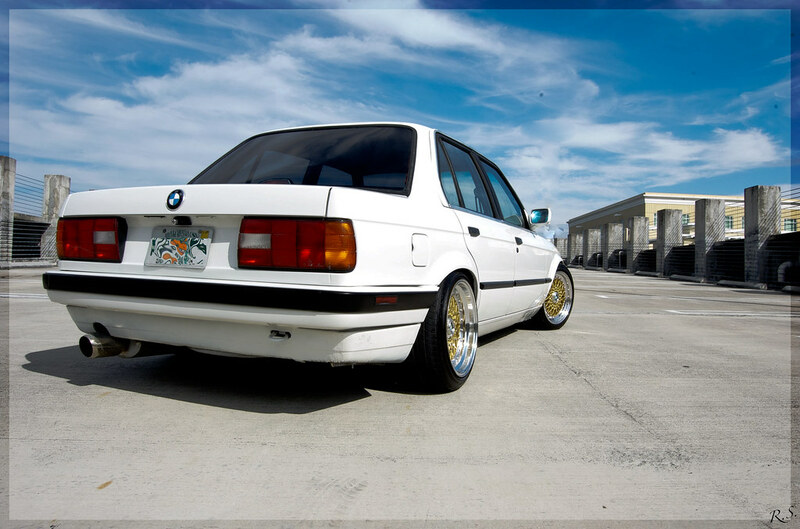 BBS RM's were put on this earth for E30 owners to bolt 1-2" larger lips on them. Thanks Jay for your expert opinion. I have '89 325is with bilstein sports and h&r sport springs. Right now I have the 14x6.5" basketweaves with 195/65/14 tires. For this option, I have seen what's usually suggested with STOCK SUSPENSION i believe: is running the x9's at all four corners (vs. running a x8 up front) and using 205/45/16 tires all around. Also running a 3mm spacer up front and nothing in the rear. Is this correct or am I off here? Using a reference (see pic below) i'm thinking I'd need spacers in the front AND the rear to achieve a FLUSH look. I don't want the tire to extend beyond the fenders at all, and I don't want to have to roll the fenders. Would it be possible to run a wider tire? What's a wider tire you can run on all four corners without rubbing issues up front (for rotation purposes I'd like to keep them all the same). What would be the spacer setup then? I appreciate the help, it's often tough to utilize like 4 different calculator sites together to try and visualize and figure out what setups will work. Plus some automatically upsize the tire to a 235 when you tell it that you wanna run a 9" wide wheel, so that doesn't help much. For reference, this is the flush fitment i'm looking for. Not my car, but props to whomever owns it! He's running a 16x9" ET10 with 225/40/16 tires and using a 15mm spacer to get flush. So would running a et20 wheel require a 25mm spacer to get flush out back? Last edited by immymechanic; 08-08-2013 at 02:24 PM. With 8mm front spacers, yes. Keep the final offset close to +10 on a 16x9. 215/40s are the maximum most try to run although 205/45 allows for a better overall diameter and oil pan clearance. You will have to roll your fenders. You want to run 9" wide flush wheels on a car designed for 7" wheels maximum, you will have to do some work. There's no way the car pictured is 16x9 -5 225/40. What's your thoughts on the Alzor style 010 wheels from ECS Tuning? Looks like they are cast and most likely require spacers. Another rebranding of cheap Chinese replicas. They also got the offsets hilariously wrong. I think they intended to make the 16x9s +30 and the 16x8s +12 (which would have looked great on an E30 and fit more cars in general) but got the numbers backwards. Everyone has a wheel line today. Damn... I knew it was too good to be true. China factory don't care about e30, they just wanna make money right! Last edited by Slowered318; 08-16-2013 at 11:34 AM. I've got some Borbets coming that are 16x9 et15 for me E30. As for tires, I'm looking at 205/50/16 or 225/45/16 or 225/50/16. These all seem to have people claiming that they fit them on their E30s, but could you cut through the info and recommend one? I am lowered on H&R Sport springs. EDIT: I'm thinking I should go with a 205/50/16 in the front and a 225/50/16 in the rear? Last edited by MaxBell; 09-04-2013 at 08:44 PM. None of those fit. 205/45 or 215/40.